Beer maker Red Stripe is receiving widespread praise for its kind gesture towards the Jamaican women bobsleigh team competing at the Winter Olympics in Pyeongchang, South Korea. With the team facing a crisis after the dramatic departure of their German driving coach left them without a sled, the local beer manufacturer spared their blushes by offering to supply them with the necessary equipment to compete. Team coach Sandra Kiriasis quit on Wednesday, claiming she was forced out after a dispute with the Jamaica Bobsleigh and Skeleton Federation (JBSF) over the changing of her role that reportedly would not have allowed her access to the athletes. The situation became further problematic after Kiriasis, a 2006 Winter Olympic champion with Germany, threatened to take the team's sled, which she alleged was her property. 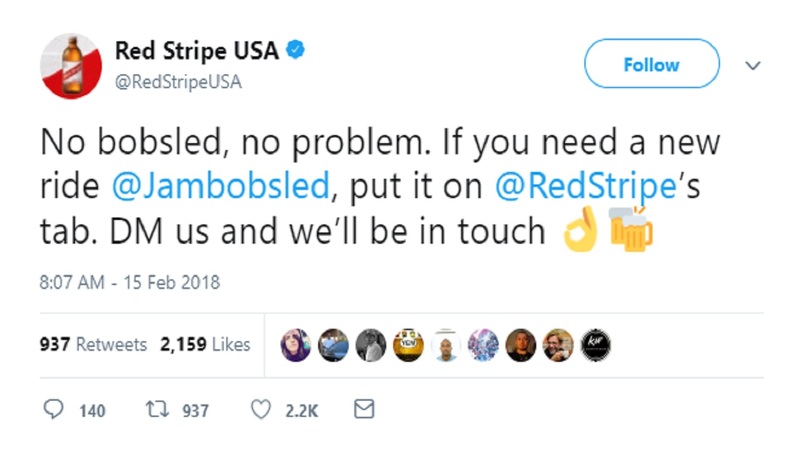 But in a patriotic – and brilliant marketing - move, Red Stripe saved the day when it reached out to the JBSF via Twitter and told them to put the sled on the beer maker’s "tab". Red Stripe's tweet has attracted more than 2,000 likes and nearly 1,000 retweets from people across the world. Explaining the rationale behind the move, Red Stripe senior marketing manager Andrew Anguin said: “When Red Stripe caught wind of the development, we immediately huddled as a team and made the decision to show our support. “While we’re experts in beer, we didn’t know the cost of a new bobsled until we spoke with representatives from the Jamaica Bobsleigh and Skeleton Federation. We have an amazing team who pulled it all together to make the purchase happen in record time," Anguin said. The company has received widespread praise for the move. 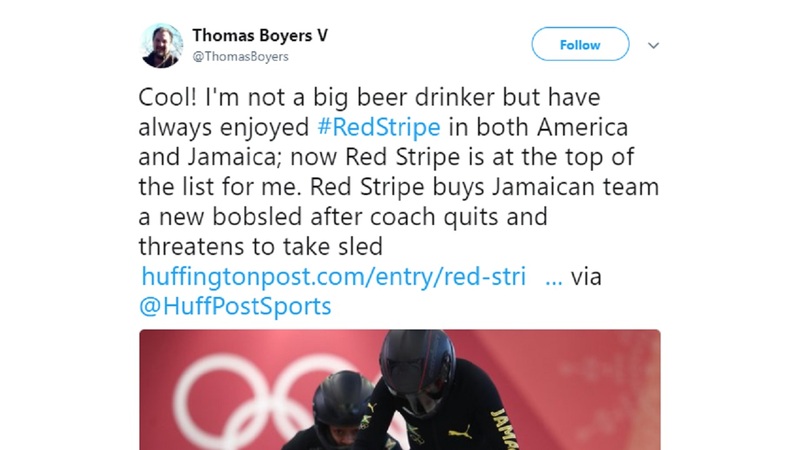 Jamaican sports administrator Dalton Myers tweeted: "Whoever at Red Stripe came up with the idea to sponsor the bobsled deserve a promotion and the social media team all deserve extra pay, promotion and additional vacation leave." He was among hundreds of social media users hailing the beer maker for its gesture. Thomas Boyers V tweeted: "Cool! I'm not a big beer drinker but have always enjoyed #RedStripe in both America and Jamaica; now Red Stripe is at the top of the list for me. Red Stripe buys Jamaican team a new bobsled after coach quits and threatens to take sled." Meanwhile, another Twitter user, Nikki Irish added: "I’m going to have a Red Stripe or two in honor of @RedStripeUSA saving the Olympics for the Jamaican bobsled team!" The JBSF has since confirmed that it accepted the offer from Red Stripe and is now preparing the sled for competition. The BBC, CNN, USA Today and a host of other global news organizations have picked up the story. Meanwhile, the Jamaican team is slated to compete in their first heats next week, with training getting underway over the weekend. "This was a great opportunity for us to support the team and brand Jamaica on the world stage. As a business Red Stripe celebrates 100 years this year and there is no better way to honour that history than ensuring that Jamaica continues to make its mark on the world," said Nasha-Monique Douglas, senior brand manager for Red Stripe. It adds a new chapter to the fairytale story about Jamaica’s national bobsled team, which became famous during the 1988 Winter Olympics and inspired the 1993 film "Cool Runnings."